For Sale! 360 Gallon Acrylic Aquarium with Mahogany Stand and Canopy. I buffed out most of the scratches so it’s ready for you to use. Tank is currently empty. Worth more than $5,000 brand new. 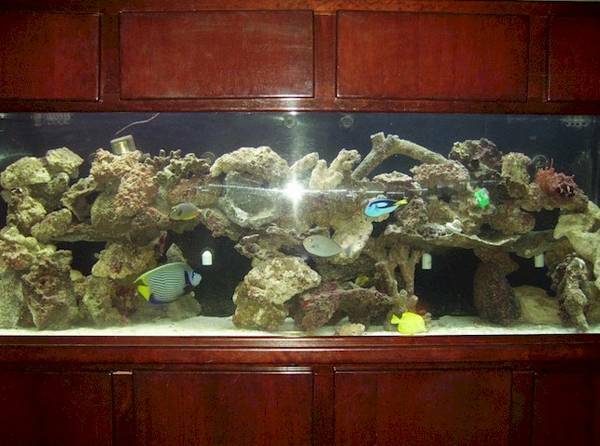 Purchase a nice aquarium for a fraction of the price. Tank dimensions: 8 feet long, 30 inches deep, 30 inches high. Mahogany Stand: 3 feet high. Mahogany Canopy: 13 inches high. Total, the stand, tank and canopy stand 77 inches high. Also included is a 30 gallon sump that fits below the tank, as well as some big rocks and sand that is in the tank now. The tank has an enclosed overflow section for a circulating pump and drilled holes for complete circulation throughout the entire tank. There is one drilled hole in the rear of the tank to accommodate a sump. If you don’t want to use the sump, you can simply close this off. Great for Saltwater or Freshwater. Email me at PeraInvestments AT gmail DOT com. Please use the normal email format for spam purposes.